Want to find a local contact to get food help in your area? Head to the Vinnies Queensland portal to find services in your local area. If you need food assistance in Queensland, please contact your local helpline or contact centre on 1800 VINNIES (1800 846 643). Vinnies soup vans operate where the need is greatest in capital cities and regional centres. For more information on our food services, or to learn how to support the service or get involved, click on the relevant link below. Vinnies soup vans operate where the need is greatest in capital cities and regional centres. For more information on our food services click on the relevant link below. 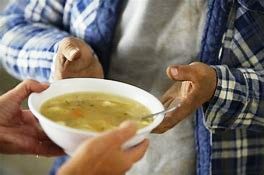 Vinnies is nourishing the hungriest and neediest in our community providing all kinds of nourishment, from hot meals, drinks and snacks to companionship and community. Food is just one of these necessities Vinnies provides to individuals and families through its Emergency Relief & Home Visitation Program. To access food in the metropolitan area of Western Australia please call 1300 794 54 weekdays 9:00am to 1:00pm. Vinnies soup vans operate where the need is greatest in capital cities and regional centres. They do so with the generous support of our many volunteers, sponsors, donors and suppliers. For more information on our food services click on the relevant link below. For more information on our other food services – click on the relevant links below.